Years ago the snack market in North America might have been devoted, in large part, to roasted peanuts, processed on simple, single-ingredient roasting equipment. Today the global rise of better-for-you snacks is creating demand for nuts and seeds of all varieties. Whether packaged as trail mix, served in individual snack packs or used as ingredients in a nutrition bar, roasted nuts and seeds have numerous flavor and application possibilities. Products that blend mixtures of nuts and seeds require custom equipment capable of processing multiple ingredients that can vary widely in size, shape and consistency. Our customers roast a variety of peanuts and tree nuts. We carved out a niche in the roasting market to serve the lower-end capacity of industrial producers (between 500-5,000 lbs/hr). We manufacture with sanitation in mind so that down time is minimal during product changeover. AC Horn Manufacturing can design and build models that rise to the challenge of roasting multiple types of nuts and seeds, taking into consideration the unique characteristics of these raw ingredients. Whether the differences are subtle or significant our equipment roasts to perfection. We draw upon years of expertise to build finely crafted equipment and adapt it to customer specifications. Look to Horn for equipment that produces the most delicious, consistent and evenly roasted nuts and seeds of all types and sizes, every time. AC Horn Manufacturing Batch Roasters are top choices for a company seeking a low-cost, high-quality roaster. These roasters ensure uniform roasting for maximum flavor development. Two different models provide capacities of 1,000 lbs/hr or 2,000 lbs/hr, respectively. 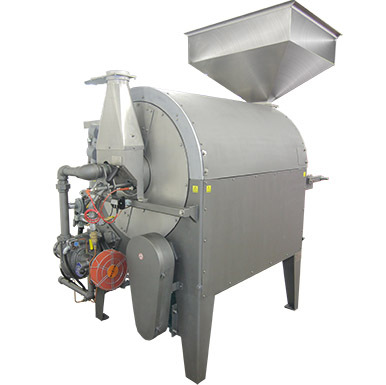 Both sizes of batch roaster have manual or fully automatic operating options. Uniform color penetration, fast heat transfer, minimal fuel usage and precision roasting in a continuous, automatic operating cycle make our roasters an excellent choice for nut processors to provide a high quality product to their customers. Our batch roasters come factory prewired and program tested for immediate, trouble-free operation. And since coolers are necessary in most applications, we offer a belted cooler that is easily integrated with the batch roaster. These machines are the top choice in the industry for fully roasting or drying peanuts, almonds, pistachios, Japanese peanuts, sesame, pumpkin & sunflower seeds, and other similar types of nuts, seeds and grains, shelled and/or unshelled. Putting quality into the entire process is exactly what we’ve done with our new Telford Turbo-Flo Roaster. Designed to meet virtually every roasting and drying need for nuts, seeds and other applications, AC Horn Manufacturing implemented state-of-the-art processing technology to ensure even, consistent roasting and drying. This results in ton after ton of consistent, quality product. The Telford Turbo-Flo also provides maximum fuel efficiency with the lowest possible operating cost. These ovens are chosen by food processors throughout the world when roasting or drying peanuts, almonds, hazelnuts, sunflower seeds or other similar materials. Data Recorder: Added to control panel for pasteurization verification. Maintains record of temperature throughout product bed, data used to verify roaster up to a 5 log kill for peanuts and most tree nuts. Fully programmable and integrated with main control panel through PLC. Wash Brush: Added to the base of the roaster to clean the belt while the roaster is in operation; can be run while the unit is running or not. Includes brushes that run full width of the belt, piping, spray nozzles, and 304 S.S. catch pan. Water Quench System: Roaster includes a water quench system in case of a fire inside the roaster. This feature includes a control panel, which is set to deploy at a preset temperature. The system also includes a manual shut-off with solenoid valve, spray manifold mounted inside the roaster complete with spray nozzles. Infeed Hopper Distribution Chute: Distributes incoming product from a conveyor or a Seasoning Tumbler system, which maintains a more even bed in the infeed hopper to prevent/minimize mounding. Infeed Hopper Distribution Auger: Helps to distribute incoming product from a conveyor or a seasoning tumbler system. Exit Chute: Stainless steel exit chute; gently lowers fragile product to the conveyor. Exit Declumper Chute: Breaks up clumps using four sets of rakes, hanging in the heat zone section of the Telford. The rake rods are positioned to move the product around as they pass through, attempting to keep clumps from forming. Our granulator is the only machine that is exclusively designed to granulate any and all nut varieties. 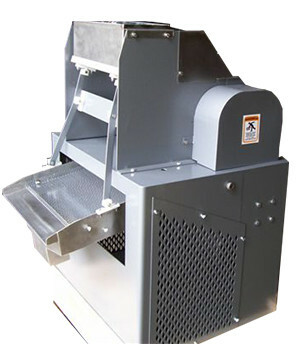 Instead of crushing the product as other multipurpose machines do, it is uniquely designed to comminute nuts into defined, sharp-edged granules with minimum production of fines. One key feature is its flexibility. The operator can choose from eight knife spacings ranging between 1/16” to ¼”. The granulator is both efficient and clean, with most contact parts made of stainless steel. It is available in three models with capacities ranging from 600 to 2,400 lbs/hr. 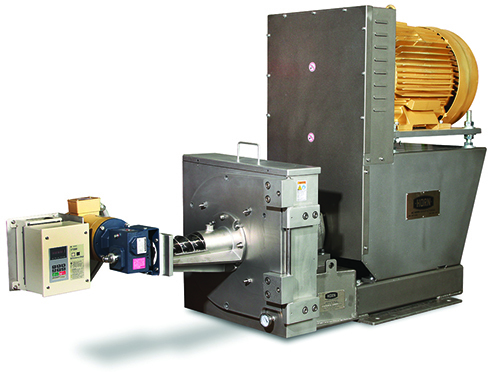 This highly versatile, single-disk attrition mill can be used in multiple production and laboratory applications for both food and industrial products. Painstakingly engineered to exacting tolerances, our mill can grind a wide variety of peanuts and tree nuts with a precision unmatched by other mills. Its food processing performance is second to none with the capability to produce smooth, easy-to-spread nut butter, perfectly blending stabilizer, salt, dextrose, etc., to produce a mix of creamy smooth consistency. The legendary Bauer Mill has long been recommended by the U.S. Department of Agriculture for the preparation of cottonseed samples (this sampling requires Bauer Plate No. 8503 and a mill speed of 3600 RPM). The American Oil Chemist Society endorsed our mill and its use is standard among the society’s membership. Its dependable performance makes it the mill of choice for a wide number of agricultural experimental stations, university laboratories and industrial research and development departments.